The Sussex County Council met Tuesday morning in Georgetown – and had a rather full agenda. County Administrator Todd Lawson told the council that on Thursday, April 4th, the council chambers will be turned over to high school students from around the county who are part of Boys and Girls State. They will take over the council’s leadership roles and decide issues that are brought to them by department staff. The mock council session begins at 9:30am and can be viewed on the County Government’s webstream. The meeting begins with public comment and for the past few weeks, Georgetown’s Jim Martin has spoken about affordable housing – in an effort to help the homeless and veterans by way of tiny houses. Each week more people have joined his call and have also spoken to the council on housing issues and the need for fair and affordable housing. 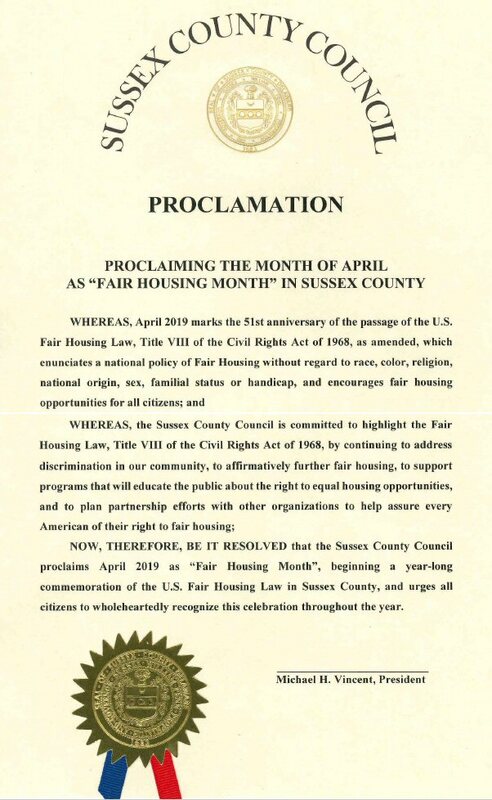 During County Administrator Todd Lawson’s Administrator’s Report, he read a proclamation declaring April as Fair Housing Month in Sussex County. However the proclamation deals more with discrimination and the Fair Housing Law in Sussex County. A second proclamation was also read for National Service Recognition Day. The council heard a presentation from the Sussex County Police Chiefs Association. Chief Robert Longo from Milton PD and Chief R L Hughes from Georgetown PD spoke – and thanked the county for grant funding that the local police agencies annually in the county budget. They discussed the various duties performed by the over 183 officers in 20 municipal police departments serving 75,000 residents. They are seeing an increase in vehicle crashes and the opioid crisis, which affects every community. Chief Longo told the Council about a plan that the Police Chiefs Association will bring before them in the near future that is an alternative to incarceration. They also learned more about a program that the Georgetown Police recently put in place that adds a Mental Health Clinician to patrols. The County Administrator updated the council on a legislative issue that is being watched in Dover – a property maintenance bill out of Kent County. (HB 87 – This Act enables Kent County to establish regulations regarding property maintenance and penalties for violations of said regulations.) Mr. Lawson says that the current language in the bill would not pertain to Sussex County, but if enacted for Sussex would give the county the authority to do what they already do – but in a better way. For Sussex County – it would deal with things like tall grass or trash – but violations are complaint-driven – and can take weeks to be dealt with. County Attorney Everett Moore tells the council that if the measure passes – the Sussex County Council would be required to look at possible changes that are enabled by the bill – like a civil fine structure. The legislation would shorten the period of time between a violation and action being taken. An update was given to the Council on the Buffers and Wetlands Working Group, which has met three times since February and County Administrator Lawson says they have reworked definitions because the group found that today’s code with the current definitions are not working. The working group meets again this week – and Lawson says they’ll take the updated definitions and start discussing how they will be used to protect the streams and wetlands. Eventually this will come to the Planning & Zoning Commission and County Council as a draft ordinance. There was just one public hearing today, which was held during the morning session. A conditional use application for a solar array on about 79 acres of current farm land off Nine Foot Road west of Dagsboro. The applicant told the council that the solar facility would produce about 6 megawatts of power that would be sent straight to the power grid. A couple who live adjacent to the property spoke out against the application, citing possible health and other issues. The council’s vote to approve the application was unanimous.